[S11] Alison Weir, Britain's Royal Families: The Complete Genealogy (London, U.K.: The Bodley Head, 1999), page 166. Hereinafter cited as Britain's Royal Families. [S18] Matthew H.C.G., editor, Dictionary of National Biography on CD-ROM (Oxford, U.K.: Oxford University Press, 1995), reference "Kenneth I, -860". Hereinafter cited as Dictionary of National Biography. Run Macarthagail, King of Strathclyde married unknown daughter (? ), daughter of Kenneth I 'the Hardy', King of Alba.1 He died in 877. He gained the title of King Run of Strathclyde in 872. [S11] Alison Weir, Britain's Royal Families: The Complete Genealogy (London, U.K.: The Bodley Head, 1999), page 169. Hereinafter cited as Britain's Royal Families. Succeeded his brother, Kenneth mac Alpin in 1858. On his death, succeeded by his nephew, Constantine I. [S11] Alison Weir, Britain's Royal Families: The Complete Genealogy (London, U.K.: The Bodley Head, 1999), page 167. Hereinafter cited as Britain's Royal Families. 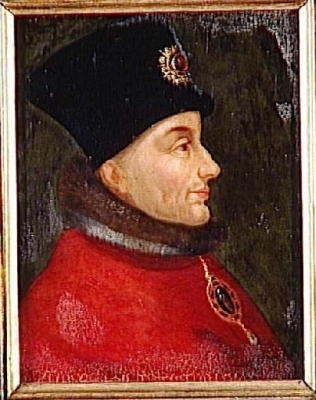 Pierre I de Luxembourg, Comte de St. Pol, Brienne et Conservan was born in 1385.2 He was the son of Jean de Luxembourg, Seigneur de Beaurevoir et Richeburg and Margaret d'Enghein. He married Margherita del Balzo, daughter of Francesco I del Balzo, Duca di Andria and Sveva Orsini, on 8 May 1405.2 He died on 31 August 1443. He gained the title of Comte de St. Pol.1 He gained the title of Comte de Conservan. He gained the title of Comte de Brienne. [S6] Cokayne, and others, The Complete Peerage, volume I, page 250.